Is there a holiday more deeply imbued with unreasonable expectations than New Year's Eve? Sure, Columbus Day is always high pressure, and don't even get started on the stresses of Armistice Day, but nothing compares to the anxiety induced by the inevitable midnight ball drop. Where will you be on New Years? Will you be running around in the cold looking for the boy who didn't kiss you last year? Will you be wearing awkwardly numerical glasses? How about you take all the stress out of the holiday by hosting your own affair? Perhaps something tasteful involving glitter and a nice selection of alcohol? 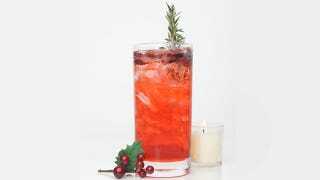 In order to guarantee that your prepared for the perfect party, we've concocted a handy guide featuring recipes to a whole bevy of festive beverages—courtesy of our friends, SKYY Vodka. Combine all ingredients in a mixing glass. Add ice and shake vigorously. Strain over ice into a high ball glass, and fill with club soda. Garnish with fresh Raspberries. Head here now for more tips, tricks and recipes perfect for making your holiday a happy one. Combine ingredients and shake over ice. Strain into a martini glass and top with a pinch of ground cinnamon and nutmeg. Garnish with a cherry. Muddle rosemary with lemon juice and simple syrup in a shaker. Add ice and SKYY Citrus Infusions Vodka and shake. Strain over fresh ice and top with soda. Garnish with fresh rosemary sprig.